One of my tricks to combat the nightly “what are we having for dinner?” dilemma is to keep some basic menu items in the freezer. One of these is shrimp. Jewel has been eating shrimp since she was old enough to sit in the shopping cart and order it herself from the seafood counter at Publix. I’d order a pound of tilapia, and she would say, “I want simp. Simp please!” Who can turn down a toddler asking for shrimp? She’d snack on a few cooked shrimp while we shopped. She was 7 or 8 before she realized that other kids asked for cookies at Publix. Dora was a more recent convert. She’s been willingly eating boiled shrimp lately, but when we tried this recipe she said it was the best shrimp ever. I’m inclined to agree. I found this recipe on Pinterest. Preheat oven to 350. Line a broiler pan with aluminum foil. 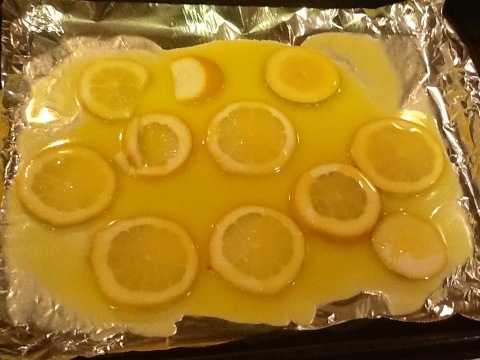 Place lemon slices on pan. 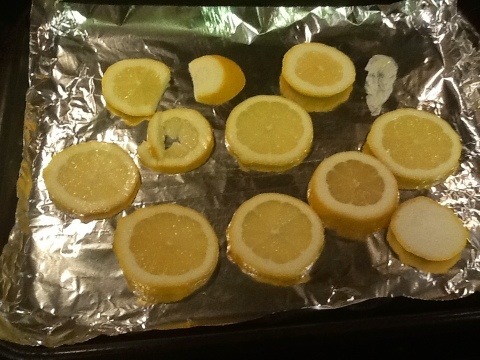 Pour melted butter over lemon slices. 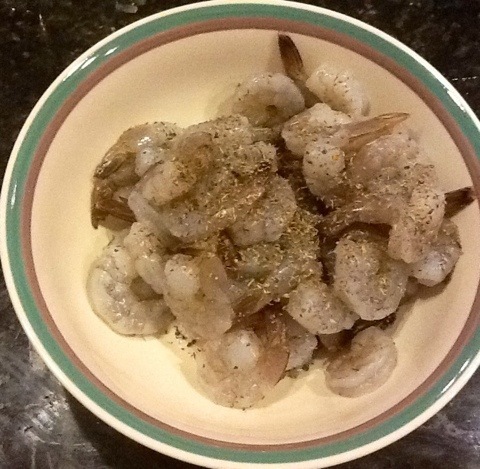 Toss shrimp with Italian seasoning and seafood seasoning. 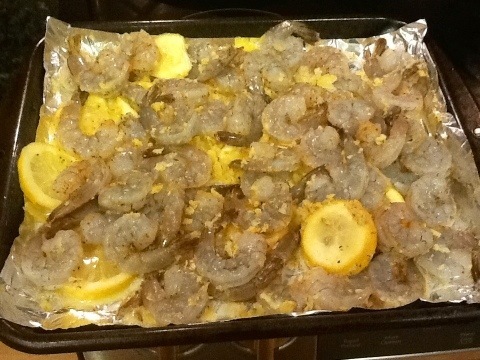 Add shrimp to pan and toss with butter and lemon. 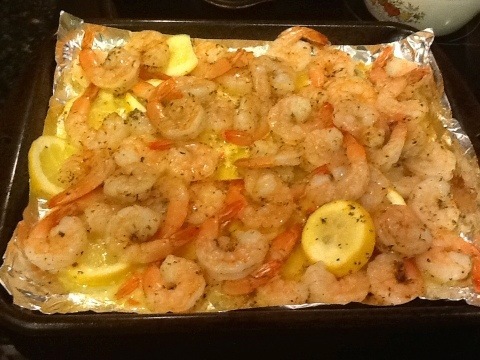 Bake for 10-15 minutes, or until shrimp turn pink and opaque. This tastes like fancy restaurant food. Serve this for company that you want to impress without putting a lot of effort into it. I served this with baked sweet potato with coconut flakes and dried cranberries and collard greens. Oh, and we had homemade truffles for dessert. Stay tuned! Will definitely try this some Friday in Lent. Or any other time. Love the combination of flavors.